Something about the man’s voice is faintly familiar but all she can do is stay on the line and, after talking for hours and losing sense of time passing, coax him back from the edge. It’s a place I used to visit when I was young, a little town in Wales where I always went to do my Christmas shopping, and used to love going there every year. When I started thinking about It’s a Wonderful Night and where it would be set, this was the place that came to mind without consciously thinking about it. I could instantly picture the shops I had envisioned in the book in this real setting, despite the fact I haven’t been there for at least eighteen years. I went on Google Maps and had a look at the place on Street View, and instead of the bustling busy place that I remembered, now it’s all faded shops and boarded up empty buildings. It made me sad to see it as it is now – a real reminder of the ‘death of the high street’ stories we constantly see on the news. That inspired the part of the story where Georgia and Leo try to bring Christmas back to their own failing high street. One of the things I love about writing books is that you can use little anecdotes from real life that you wouldn’t get to share anywhere else. For example, the part where Georgia tells Leo about singing along to The Wombles with a random woman in a supermarket – this actually happened to me! It was a brilliant moment, and I thought at the time that I would use it in a book one day! I used to work in a charity shop so I got to use a bit of experience from that, and when Georgia mentions that the shop phone is a wired one fixed to the wall because someone accidentally sold the cordless one – that genuinely happened in the charity shop where I worked! After seeing a poor cover version on TV, I was listening to the original on Youtube and the idea of someone working on a suicide prevention helpline and answering the phone to a voice she recognised popped into my head. I’ve always thought that the song inspired it somehow, even though I don’t quite understand the connection! I can’t listen to music while I write because it stops me concentrating, but generally each book has a ‘soundtrack’ – usually one or two songs that I listen to before I start writing each day. For this book, it was Under Pressure and the other song was Being Alive from Company, a line of which also became a theme in the book. I’d already named Georgia Bailey and outlined the plot before I realised there were similarities between my story and our best-loved Christmas film! Georgia stops Leo from jumping off a bridge, like Clarence does for George in the film, and I realised I could use the similarities as a hook for my story. The more I thought about it, the more it seemed to naturally fit, even to the point where Georgia pretends to work in a bank, similar to where the real George Bailey works in the film, and I didn’t even realise this myself until the moment Leo points it out in chapter three! 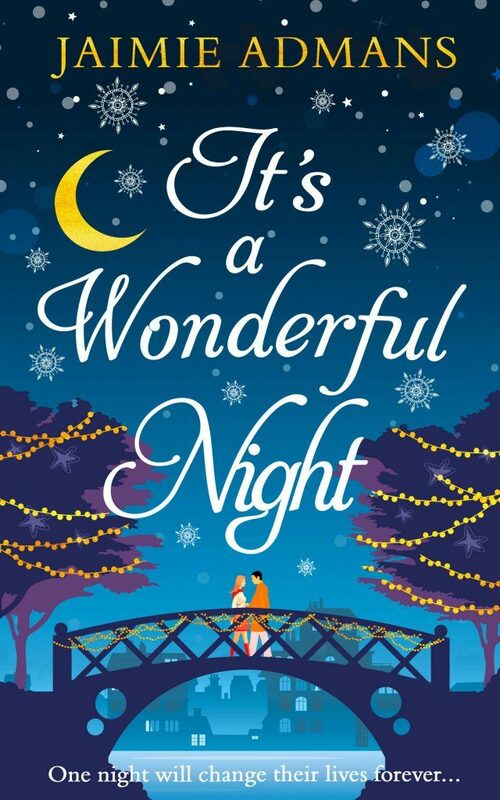 I wanted a title that tied in with the film too, and my working title was Every Time A Bell Rings, which I didn’t expect to be able to keep, and my editor renamed it to It’s a Wonderful Night, which I love and is a much better fit! For about five years now, I’ve been friends with someone who I call ‘the happiest guy I know’. He makes me laugh every time I speak to him. If I’m feeling down, I send him a text or email because I know he’ll cheer me up. He’s never without a smile and something hilarious to say. And we were chatting one night and he opened up about having low self esteem, anxiety, and struggles with depression. I really wanted to show this through Leo. I wanted to show that no matter how much someone laughs and jokes, you have no idea what’s going on behind their smile. I wanted to show that he makes Georgia happy every morning but he’s struggling so much behind the bright smile he gives her every day. I’ve lost family members and close friends to suicide, it’s something I care about a lot, and as I write romantic comedies, I never thought I’d get a chance to write about it, but I wanted to show that even the people you think are fine can find themselves at rock bottom, and I sincerely hope I’ve handled it sensitively enough and with hopefully a bit of humour too. 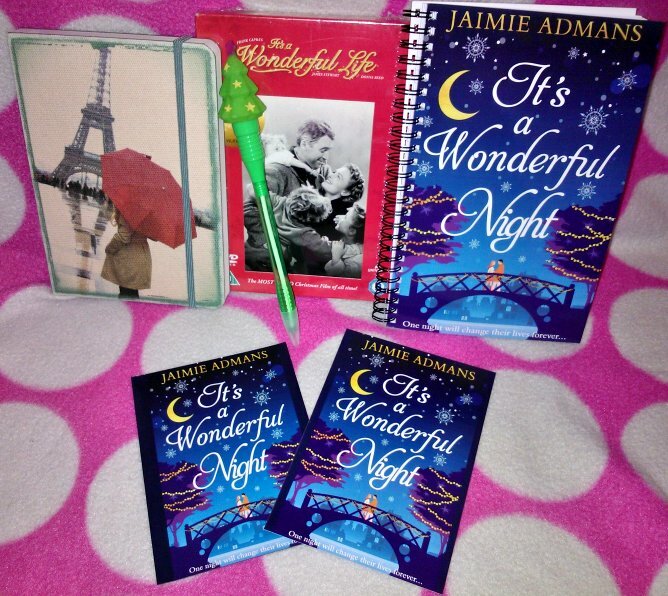 She is the author of chick-lit romantic comedies The Chateau of Happily Ever Afters, The Little Wedding Island, It’s a Wonderful Night, and Kismetology, and she has also written young-adult romantic comedies Afterlife Academy, Not Pretty Enough, and North Pole Reform School. *A copy of It’s a Wonderful Life on DVD because this is the inspiration behind the story. *An invisible spine Paris notebook because it’s where Georgia wants to go more than anywhere in the world. *A light-up Christmas tree pen, because who doesn’t need a light-up Christmas tree pen at this time of year? !